Feiwel & Friends, 9781250023513, 320pp. This final book in the New York Times-bestselling Fairyland series finds September accidentally crowned the Queen of Fairyland. But there are others who believe they have a fair and good claim on the throne, so there is a Royal Race—whoever wins will seize the crown. Along the way, beloved characters including the Wyverary, A-Through-L, the boy Saturday, the changelings Hawthorn and Tamburlaine, the wombat Blunderbuss, and the gramophone Scratch are caught up in the madness. And September's parents have crossed the universe to find their daughter. Who will win? What will become of September, Saturday, and A-Through-L? The answers will surprise you, and are as bewitching and bedazzling as fans of this series by Catherynne M. Valente have come to expect. 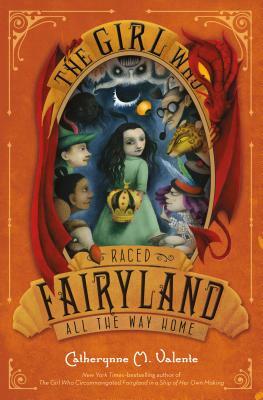 Catherynne M. Valente, the acclaimed author of many books for adults, made her children’s book debut with The Girl Who Circumnavigated Fairyland in a Ship of Her Own Making. She lives on an island off the coast of Maine with her husband. ANA JUAN is a world-renowned illustrator known in this country for her wonderful covers for the New Yorker magazine, as well as the children's books The Night Eater, and Frida, written by Jonah Winter. She lives in Spain.